Hello, Hello, Hello My Loves!! I fell absolutely in love with this season's prints and pop color accents like chartreuse, coral, and tangerine. 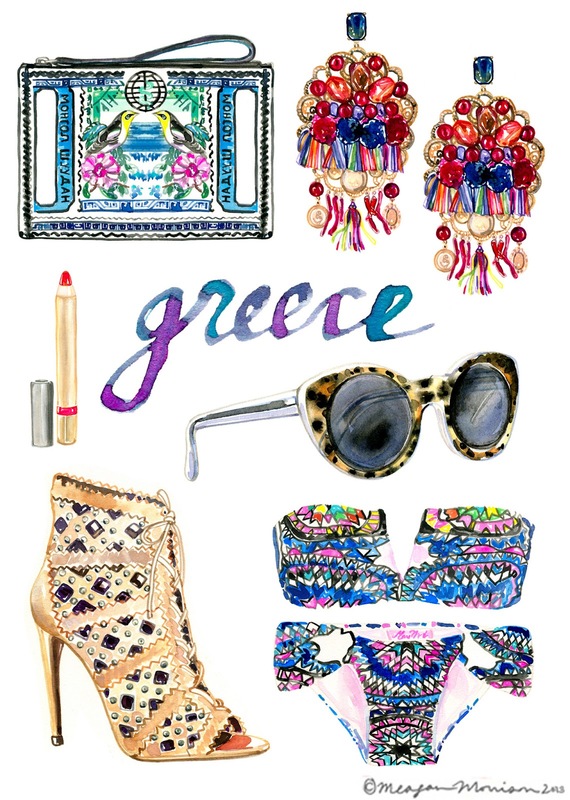 I'm having visions of Santorini's aqua blue waters as the backdrop to my saturated colored ensembles. The outfits make the trip don't they?! How are you all spending your Memorial Day holiday? Have any of you been to the Greek Islands? If so leave your suggestions below. I thought they are real! OMG! Amazing! I love your illustrations. Beautiful! Nice speech. Thank you. I'm going to this year's summer holiday in Fethiye. Oludeniz, Butterfly Valley and would like to see. your soooo talented!!! i cant get over it! your art work is just amazing!! !